When looking for the perfect gift for your loved one, a giant teddy bear is an obvious yet thoughtful choice. Everyone loves a big cuddly bear! 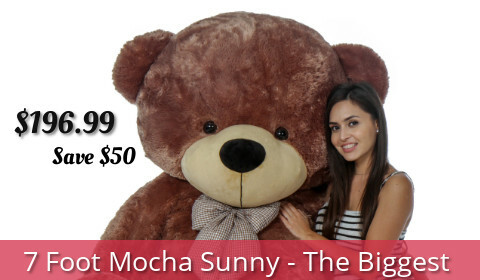 With our large teddy bear deals, get the best value on this special gift for your special occasion. We have compiled all of our best selling teddy bears in one convenient place so you can find the right choice with ease. 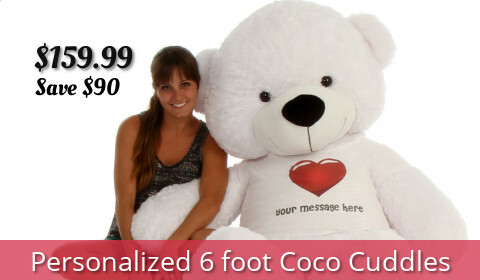 From our 4-foot options to our life-sized options, find the right bear for your loved one or special occasion right here! We offer a range of choices when shopping our large teddy bear deals. For instance, you will find several color choices when shopping our bear selection. The most natural and obvious choice for this animal is brown, but we don't offer just boring one-shade-fits-all brown. Choose from mocha, amber, chocolate, and more when shopping for a brown bear with us. For those looking for bolder colors, check out the purples, pinks, and more for a lively hue sure to excite. Whether you choose a white bear, a colorful bear, or even a panda bear, our selection has plenty of options to choose from for this gift. You will also find several style choices when shopping our lineup of best selling teddy bears. From bears holding hearts with special messages to bears dressed in a ribbon, there are plenty of options for showing your loved one how much you care with a special stuffed animal. 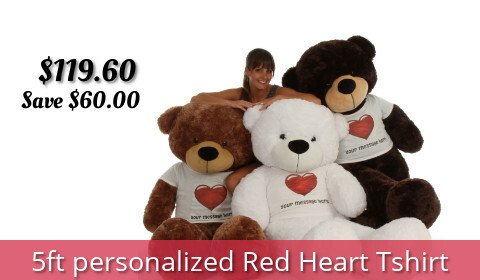 We also offer several of these bears in t-shirts which can carry a special message for a custom and personalized gift. Whether you want to wish someone a happy birthday or say a special message like "Will you marry me? ", our custom bears are the perfect way to go big and bold with your gift. Let us create a truly special gift for any occasion with our custom bears. If you have any questions while shopping with us, please contact us for assistance. We are always happy to help you find the perfect gift.